The proposed building of market-rate condos for 490 South Van Ness. 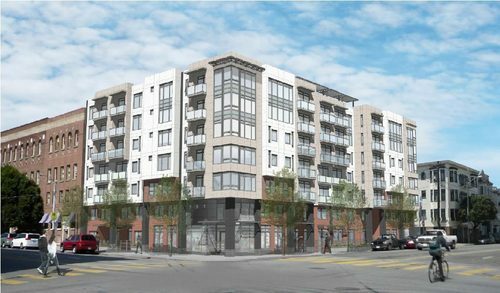 The Plaza 16 Coalition opposes more market rate development, such as this one, in the Mission until the City of San Francisco meets the need for truly affordable housing. Planning Commission Meeting Thursday, October 2, 2:00 PM City Hall, Room 400 1 Dr. Carlton B. Goodlett Place The 490 South Van Ness agenda item should be heard at around 2:00 or 2:30pm, but the schedule can change unexpectedly. The Planning Commission will consider approving the 490 S. Van Ness development at its weekly meeting this Thursday, October 2. Almost all the Planning Commissioners spoke favorably about the 7 story condominium development when they delayed their decision at their September 4th hearing. Here is the agenda for Thursday’s meeting. 490 South Van Ness is expected to come up at about 2:00 or 2:30pm. $61,150 (1 person), $69,950 (2 people), $78,650 (3 people), $87,400 (4 people), $94,350 (5 people) etc. and will require additional homeowner association fees. All indication is that the Commission will vote to approve this project despite continued concerns about its lack of affordability for poor and working class people, its potentially dangerous underground parking garage access onto narrow, one-way Adair Street, its blockage of sunlight for the adjoining historic Redstone Building and other design issues. The Plaza 16 Coalition has publicly opposed the project at previous hearings. Read more about the project and our reasons for opposing it in this previous post. This may be the final vote on the project and the last opportunity for the public to express their opposition. Let us know at Andy@Plaza16.org if you plan to attend the hearing and speak at public comment.